Are you a cycling enthusiast? Get thirsty on your long trips and looking for that perfect Bike Bottle? We have the answer for you. Superior to traditional sports push-pull sports bottle caps and closures, The ProShot is easy to use and extremely sanitary because is requires no hands or mouth to open. Simply squeeze the bottle to drink and release to close the spill proof, leak proof valve. Are you excited yet? These USA made bottles come with ounce markings and view stripe. Now you can have the bottle that the Pros use. There is no better way to promote your company than with these water bottles. Own or manage a gym with Spin classes, other classes and machines? 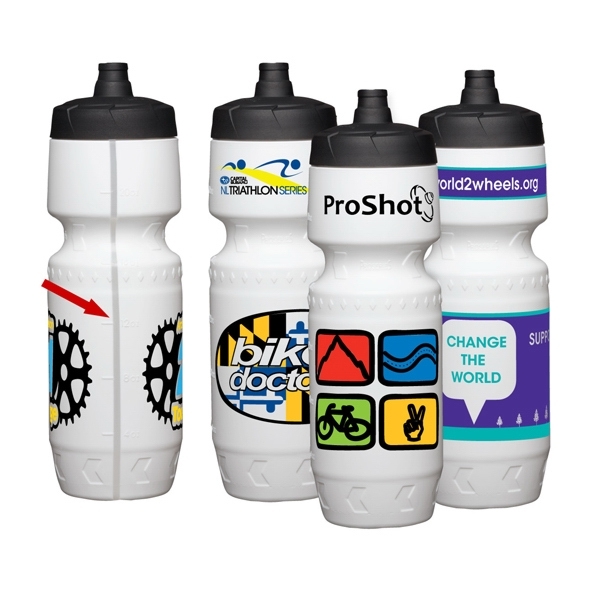 Give them one of the Pro Water Bottles when they sign up a membership or sell them in you company store. Own or manage a bike shop? How about giving one away with the purchase of a bike or exspensive biking gear. Keep top of mind when they use and talk about these great bottles.